The 13-valent pneumococcal conjugate vaccine prevents acute otitis media caused by Streptococcus pneumoniae. 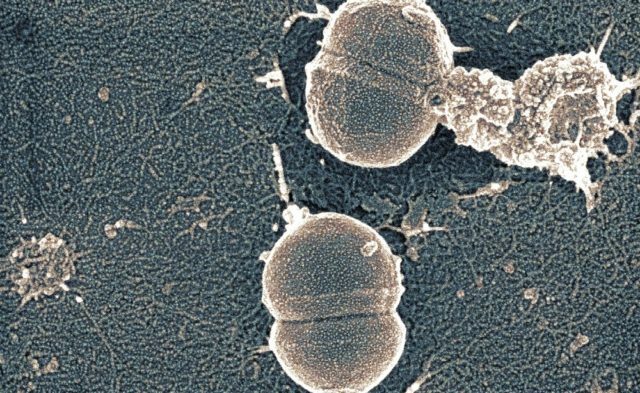 The 13-valent pneumococcal conjugate vaccine (PCV13) prevents acute otitis media caused by Streptococcus pneumoniae-expressing serotypes included in the vaccine, according to a study recently published in the Lancet. Otitis media is 1 of the most common reasons for outpatient care of children in the United States. A 7-valent pneumococcal conjugate vaccine (PCV7) was licensed for use in 2011 on the basis of the findings of randomized controlled efficacy trials. PCV7 is recommended for active immunization against invasive pneumococcal disease and acute otitis media caused by S. pneumoniae serotypes included in the vaccine (4, 6B, 9V, 14, 18C, 19F, and 23F). Because PCV7 was widely used during the development of PCV13, similar efficacy trials were not feasible. Instead, the use of PCV13 in children was considered on the basis of comparative immunogenicity to PCV7. In 2010, PCV13 was approved in the United States and indicated for active immunization of children against invasive disease caused by pneumococci-expressing serotypes included in the vaccine, and against acute otitis media caused by pneumococci-expressing serotypes common to PCV7 and PCV13. However, the vaccine is not indicated for protection against acute otitis media caused by the 6 additional serotypes in PCV13 (1, 3, 5, 6A, 7F, and 19A) because of the lack of efficacy data before licensing. Therefore, this phase 4, observational study aimed to assess the efficacy of PCV13 in preventing acute otitis media caused by the 6 serotypes in PCV13 that were not in PCV7 (ClinicalTrials.gov identifier: NCT01199016). From 2010 to 2013, 239 healthy children (median age, 6.3 months) from a private pediatric practice in Rochester, New York, who had received the full primary series of PCV13 were enrolled, 77 of whom withdrew. In addition, 348 children (median age, 6.5 months) who had been vaccinated for PCV7 enrolled in a longitudinal study at the practice from 2007 to 2009 were used as control patients, 100 of whom withdrew. Middle-ear fluid (MEF) was collected by tympanocentesis and assessed for the serotypes common to PCV7 and PCV13, along with the 6 additional serotypes specific to PCV13. Participants were followed up to age 30 to 36 months to identify episodes of acute otitis media. The primary outcome was the efficacy of PCV13 to prevent acute otitis media caused by pneumococci expressing the 6 capsular serotypes not included in PCV7. A total of 223 MEF samples were obtained at the onset of acute otitis media from 90 children in the PCV13 cohort. Of these, 24% were culture positive for S. pneumoniae, compared with 31% in the PCV7 cohort (P =.06). Furthermore, 8% of the PCV13 cohort contained pneumococci expressing 1 of the additional PCV13 capsular serotypes compared with 52% of the PCV7 cohort, giving a relative reduction of 86% (P =.0010). The greatest reduction in MEF samples was in serotype 19A (4% in the PCV13 cohort vs 52% in the PCV7 cohort), with a relative reduction of 91% (P =.0010). S. pneumoniae strains expressing multiple drug resistance were seen in significantly fewer MEF samples in the PCV13 cohort (5% of isolates) than in the PCV7 cohort (36% of isolates; P <.0001). Disclosure: Funding was provided by Pfizer.